It seems Google wants to move everything in the tabs - not only through its web apps, but with Chrome too. A recent change in Chrome / Chromium removes the Options dialog as a separate window and you can now access it from a browser tab. 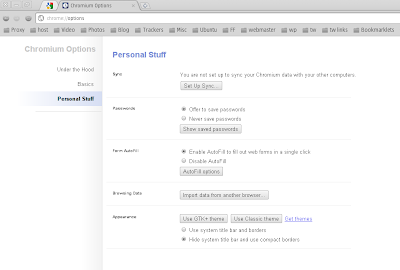 This should make it a lot easier to implement changes to the Chrome / Chromium interface across different platforms. I'm not sure if there are other reasons for implementing this, but I for one am very glad to be able to change the Chromium options from a tab instead of a window as it was a real pain to open the Options window on my netbook. This is not yet available by default so you must use the "--enable-tabbed-options" switch to enable it (I've tested it with the latest Chromium from the Chromium Daily PPA for Ubuntu, I'm not sure if this feature landed in Chrome already). 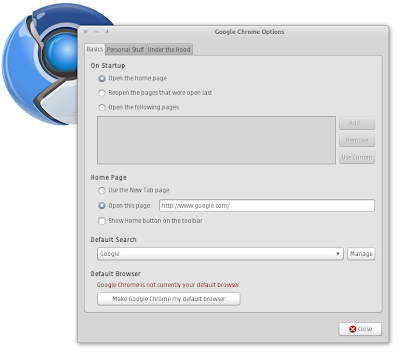 To use the tab options menu in Chromium, either edit the Chromium shortcut or the /etc/chromium-browser/default file and add "--enable-tabbed-options".